Israel and Iran are trading words and insinuations over whether the Iranian stealth drone which Hizballah launched over Israel on Oct, 6 did or did not obtain images of sensitive Israeli sites. 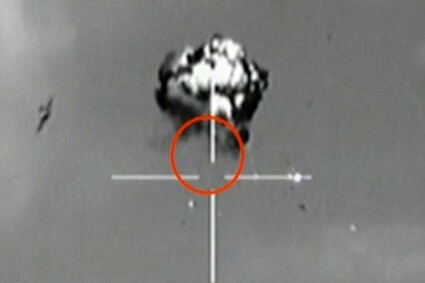 Wednesday, Oct. 31, an Iranian Revolutionary Guards (IRGC) spokesman contradicted comments made two days earlier by IDF Northern Command chief Maj. Gen. Yair Golan, who said the unmanned aircraft had not been able to take photos as Iran claimed, because "I don't think there was a camera there." IRGC spokesman Brig. Gen. Ramezan Sharif retorted: “The fact that we have obtained the images of many areas that are important for us is the proof that we have conducted a successful mission,” he said. debkafile's military sources: This was the first public admission by an Iranian official that the IRGC was indeed behind the drone’s launching from Lebanon into Israel’s air space from the Mediterranean Sea. It was shot down over the Negev desert after several hours. After the intrusion, Hizballah leader Hassan Nasrallah said his movement had sent the drone and that the aircraft was "Iranian-built and assembled in Lebanon." On Sept. 16, the IRGC chief Gen. Ali Jaafari announced that units of Al Qods Brigade, the corps’ intelligence and terror arm, had taken up position Lebanon. Lebanese President Gen. Michel Sleiman’s angry request for clarifications from Tehran has never been answered. Neither US nor Israel reacted to this infringement of Lebanese sovereignty, or to the placement of Iranian soldiers in areas bordering Israel. The IRGC official’s statement Wednesday actually confirmed the charge that Iran was using Lebanese territory for operations against Israel and that the stealth unmanned aircraft was the precursor of direct military operations. In his words, "They (Israelis) must know that we possess the information we need on necessary areas in case a particular situation arises" – indicating those areas would be targeted for Iranian retaliation in the event of an Israeli attack on Tehran's nuclear sites. His comments were released just hours after French President Francois Hollande received Israeli Prime Minister Binyamin Netanyahu at the Elysée in Paris. The issue of a nuclear Iran topped their agenda. Ahead of their meeting, Netanyahu told French reporters: "Five minutes after an attack on the Iranian nuclear program, a sense of relief would spread across the Middle East." debkafile's military and intelligence sources say that by the verbal duel, Jerusalem and Tehran are trying to find out how much the other has discovered in the wake of the drone’s expedition into Israeli airspace: Iran wants to know what Israeli cyber warfare and air force experts have learned from the downed intruder, while Israel is trying to figure out what intelligence, if any, it transmitted to the Iranian cyber warfare experts and IRGC controlling the drone operation from Hizballah security headquarters in southern Beirut. Maj. Gen. Golan threw out a hint, when he said the Iranian aerial vehicle "could fly over Israel for a long time, which could develop into filming abilities." In other words, the Iranians may have assembled images with the help of simulation equipment other than cameras. The Revolutionary Guard spokesman's comment that "we possess the information we need" fits in with the Israeli general’s remark. Also suggested by the Iranian general’s comments, say debkafile’s Western intelligence sources, is the suspicion in Tehran that their drone was not shot down by Israeli missiles, as officially reported, but downed intact with very minor damage by a joint operation of the Israel Air Force and cyber warfare experts. Now, Tehran is trying to reconstruct how much the Israelis learned from the equipment it carried.